As widely predicted, UK government action on energy bills has turned out to be another damp squib. Ministers passed the buck yet again to Ofgem who have published plans for a ‘fairer and more competitive’ market. As if we haven’t heard that before! Despite the abundance of energy supply in the UK, we still pay more than the European average. 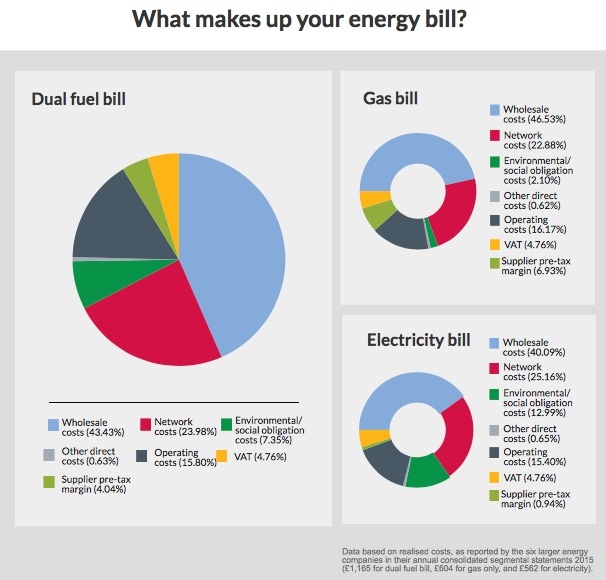 This Ofgem infographic shows how energy bills are broken down. We are told the solution is more switching in an allegedly competitive market. However, there has been a warning that more small energy firms could go bust this winter because of increasing price volatility. David Bird of Co-operative Energy said that the regulator needed to set financial stress tests for new market entrants, to reduce the risk of firms folding and customers being left in the lurch. On a more positive note it looks as if there may be some action on charges for pre-payment meters. Santander has recently highlighted how much of our declining pay packets go on largely unavoidable household bills. It looked at bills for gas, electricity, water, etc – and found they have risen far ahead of average wage rises. Since 2006, average pay packets in Britain have gone up by 19%, while the average gas bill has risen by 73% and electricity by 72%. These are very large real rises, and all the grimmer for families and pensioners on very tight budgets – not to mention public sector workers suffering years of pay restraint. These are must pay bills that leave families with harsh choices about what to cut elsewhere. This bitter pill is made all the less easy to swallow when the boss of one of Scotland’s biggest energy companies has been given a 72% pay rise, soon after arguing against consumers having their bills capped to save them £100 a year. The company also increased the price of its standard variable tariff by 6.9%. Alistair Phillips-Davies, the chief executive of SSE will be paid £2.92m in 2017 after receiving the maximum possible bonuses for leading a “robust performance” by the supplier last year. The pay rise is even bigger than the 40% rise awarded to the chief executive of the Scottish Gas owner, Centrica. Then we can add energy networks into the mix. They have been accused of exploiting consumers to enjoy a £7.5bn windfall of unjustified “sky high” profits. Citizen’s Advice reckon the companies that transmit electricity and gas around the UK, including National Grid, were reaping average profit margins of 19% from their monopolies. That compares with the 4% margin that big six suppliers make selling power and gas to householders. They have called for a one-off £285 rebate to every household. Don’t hold your breath on this one, but the companies can expect a tougher price controls next time around. In a useful analysis of the issues the HofC library argues that the key issue for Parliament will be how to make consumer markets such as energy work effectively. Can consumers be encouraged to find the best deal or does Government need to be more active? The simple truth is that markets have failed, not least because consumers have better things to do than spend hours battling the complexity of energy pricing. Government intervention is long overdue. The Taylor report into ‘Employment Practices in the Modern Economy’ does little to help workers being exploited in the workplace. The appointment of Matthew Taylor was always likely to be a safe choice for the Prime Minister in conducting this review. The report is very New Labour - progressive in ambition, but nothing too radical in practice. A classic bit of 'nudge' capitalism. The problem with this approach is that while good employers may respond to the nudge, the specific problems he was asked to consider are exploited by the cowboys. They need a regulatory kick up the backside, rather than a nudge. Dropping ‘worker’ status for that of ‘dependent contractor’, in an attempt to distinguish more clearly between those who are genuinely self-employed and those who are not. These may attract additional protections. Platform based services e.g. Deliveroo, Uber, must be able to show that that they are paying their average worker 1.2 times the national minimum wage. Responsible corporate governance, better management and stronger employment relations is apparently better than regulation. No recommendation that tribunal fees should be scrapped, although some tinkering with the system including naming and shaming employers who don’t pay awards. More helpful is a free preliminary hearing on employment status and reversal of the burden of proof. Zero-hours and agency workers should have a right to request fixed hours or a direct contract of employment after twelve months. Reintroduces ‘rolled up’ holidays acting as a disincentive to take holidays. Time off becomes a luxury for those who can afford it. If you are suffering from exploitative employment practices you might well feel pretty underwhelmed by these recommendations. This isn't just limited to the gig economy, it also applies to many in the private/voluntary home care sector. For the Prime Minister, post-Grenfell, to use phrases like ‘overbearing red tape’ shows she has learned nothing about the importance of effective regulation. On the specifics, we don’t need a new category of employment status. The courts have already been able to determine bogus self-employment when they see it. What we need is effective enforcement of legal rights. As Labour’s Rebecca Long-Bailey MP put it “If it looks like a job and smells like a job the chances are that it is a job”. On platform working, Taylor appears more concerned about cash wages for low paid workers eking out their wages at the weekend, than multi-national companies engaged in large scale tax dodging. Perhaps unsurprising when his panel included investors in these companies! By introducing a complex averaging reporting system for wages, he is effectively saying that companies shouldn’t have to pay the national minimum wage for every hour worked. No prizes for guessing who is going to get the lower paid shifts. The recommendations are built on the premise that the UK’s flexible labour market has been a great success. One of the most disappointing aspects of the Taylor report is the lack of evidence to support his assumptions. From the Chief Executive of the RSA I would have expected better. One of those assumptions is the failure to recognise that business investment per capita has almost ground to a halt. The flexible labour market encourages the substitution of cheap labour for capital, hence the dismal levels of productivity. This chart by the TUC’s Geoff Tily from OECD data, shows just how far the UK fell between 2007 and 2015. After some modest recovery the OECD are now forecasting a return to the bottom of the league. Taylor is, in effect, supporting this approach. The other consequence is increasing household debt. All our experience shows that employers, particularly those in the gig economy, will not be ‘nudged’ into best practice because the Government asks them to, or it’s the right thing to do. It is only legislation, with effective enforcement and strong collective bargaining, which will make any difference. The Taylor Report is a huge missed opportunity. It demonstrates a failure to understand the lives of workers on the fringes of decent employment. It consolidates a race to the bottom in employment practice. If the Grenfell tragedy teaches us anything, it must be that regulation is not 'Red Tape', it is an essential safeguard for a civilised society. Scotland has escaped some of the worst examples of deregulation, but we shouldn't be too quick to pat ourselves on the back. The circumstances of the Grenfell Tower fire will be subject to a judge-led inquiry and it is clear that regulations and enforcement will be one of the issues to be considered. In Scotland, a change to building regulations in 2005 made it mandatory for builders to ensure that any external cladding "inhibited" fire spreading. The new regulations were introduced following a fatal fire in an Irvine tower block in 1999. The Building (Scotland) Regulations 2004 contains the mandatory regulation: "Every building must be designed and constructed in such a way that in the event of an outbreak of fire within the building, or from an external source, the spread of fire on the external walls of the building is inhibited." This is the primary reason why no social housing tower blocks in Scotland have been found to have the type of cladding used at Grenfell. However, effective regulation is only part of the story, we also have to ensure we enforce those regulations. On this, Scotland is not doing so well. - Almost half (48%) said there have been budget cuts this year while one in five (20%) said the cuts had been severe. - There are 56 less staff working in the Building Standards departments now than in 2010. - The overwhelming majority (89%) feel their workload has got heavier in the last few years. - Almost half (47%) felt they should spend a lot more time on site visits while just 13% felt they had the right balance between site visits and office time. - 48% described morale as low, with over three quarters (78%) saying they don’t expect it to improve as a result of budget cuts, increased workload and lack of a pay rise. The report reveals a dedicated workforce committed to ensuring that buildings meet the standards required, but who are under enormous pressure. They feel exhausted, undervalued and are struggling to deal with the demands placed upon them. Previous UNISON surveys of other regulatory staff, covering, food, consumer rights, planning and the environment, highlight similar concerns. The former UK coalition and Conservative governments promised a “bonfire of red tape” with a “one-in-two-out” rule governing new regulation. In Scotland, there is a more measured approach in the Regulatory Reform (Scotland) Act, but much of the language around this legislation was similar. Too much emphasis on supporting business and not enough on compliance. On food, Scotland has abandoned the visual inspection of some animals in abattoirs and Food Standards Scotland want to go further in abandoning independent meat inspection. Environmental health officers have had to scale down their inspections of food premises due to staffing cuts. Deregulation of planning has long-term consequences in both built and natural environment, even if the consequences of poor decisions or regulation can take years to emerge. A big focus for Tory deregulation was health and safety. 137 people were killed at work last year, but this figure is dwarfed by the numbers of people dying of work-related illnesses, including at least 5,000 a year who lose their lives to asbestos-related cancers. The Hazards Campaign estimate that around 50,000 people die each year due to past poor working conditions of heart and lung diseases and work cancers,” They argue that the government’s obsession with cutting “red tape” really meant abolition of regulations which protect workers. Sensible regulation is something we all take for granted. We assume that someone is checking that the food we eat and the goods we buy are safe. Increasingly, that is simply not the case and sadly it will be a tragedy like Grenfell that causes governments to rethink the merits of light touch regulation. It is local government in Scotland that has borne the brunt of austerity cuts and the salami slicing of regulatory departments is not well understood. An effective state that protects its citizens needs people in order to actually function. If there aren’t people in central government to proactively revise and update regulations and in local government to effectively enforce them, that is a state failure. In 2015 the New Economics Foundation (NEF) concluded its major investigation into deregulation that had been unfolding behind the scenes in Whitehall for years. They called the final report ‘Threat to Democracy’ – because that is exactly what it is. NEF makes the point that regulations protect us from bad businesses (as well as, in principle at least, bad finance). It is absolutely our democratic right to demand the ability to make those rules, and see them properly enforced. It remains to be seen whether a chastened Government will, post-Grenfell, retain its deregulatory zeal. Last year NEF also warned that Brexit would only increase this deregulation drive. The Great Repeal Bill threatens to give ministers the power to strike swathes of social and environmental protection from the post-EU statute book. Grenfell might at least result in a pause on further deregulation, but what we really need is for the mindset around regulation to change. In future, we need a greater appreciation of the role of those who uphold regulatory standards and ensure that both central and local governments have the resources to keep all of us safe. Public sector pay is at least back on the political agenda. Now we need to turn the rhetoric into action. The decision of Jeremy Corbyn to put ending the public sector pay cap as a key element of Labour’s UK general election manifesto was a crucial factor in getting this issue back on the agenda. The conventional political wisdom would say focus on services, but he boldly ignored that. Even more boldly, he decided to put the issue centre stage in the Queen’s Speech debate. We now have a number of Tory MPs and even cabinet ministers like Fallon, Gove and Boris Johnson calling for a rethink on the Tory pledge to maintain the cap until 2020. However, we need to contrast that with the cheers from many Tory MPs when the Queen’s Speech vote was declared. This was emblematic of politicians who have lost their grip on reality, particularly when a ‘magic money tree’ was discovered to bribe the DUP into the lobby. The Scottish Government has also been having a rethink about its pay policy after SNP MPs supported the Labour amendment to scrap the UK version. Finance Secretary, Derek Mackay said: “The Scottish government will take into account inflation in the future pay policy." Pay policy is largely devolved and the Scottish Government’s pay policy already has some important differences to its UK counterpart, most notably in its support for the Scottish Living Wage. However, for the vast majority of public sector workers in Scotland the 1% cap is the same as the Tory UK policy. On average, public sector pay has been cut by around 14% in real terms since 2009. In recent years it is also falling behind the private sector. This matters at a time when the public sector is competing for staff in a tightening labour market. As our research on the ageing workforce shows, young people are not attracted to tough public sector jobs in care and elsewhere when they can get a less challenging job in the private sector on higher wages. Brexit will compound these problems. There are also jobs that have private sector counterparts those experienced and well trained staff can be poached, as our building control survey highlighted last week. We shouldn’t also forget the economic case for better pay. Economic growth is declining not least because disposable incomes are falling and household debt is rising. The Resolution Foundation’s work on wages highlights this as a broader problem across all sectors, but the challenge is most acute in the public sector. The recent parliamentary votes are in effect political skirmishing. The real test will be the UK autumn budget and the Scottish Government’s spending plans for 2018/19. If there is a change from the current revenue (not just capital) spending plans, then we will need to make the case for increasing pay as against other spending demands. There is little point in building roads if the workers are not there to maintain them, or hospital beds without the health care team to ensure they are used. In Scotland, there has been some recognition of this. To address the large number of elderly patients in hospitals who don’t need to be there, ministers could have simply allocated resources to additional social care packages. However, they accepted the argument put by UNISON and the employers, that given the high level of vacancies and spiralling turnover rates, this wouldn’t work. We have to recruit and retain staff in the sector and therefore a proportion of new resources were allocated to paying the Scottish Living Wage. It is not a complete solution, buts it’s an important step in the right direction. So, it is important to keep up the pressure on public sector pay, but also to prepare for the next budget round with the service delivery case for putting resources into pay and conditions. That will be the acid test for converting political rhetoric into action.